For 30 years, MetalForming magazine (known as Metal Stamping before that) has sought to inform the metalforming and fabricating communities on technology advancements and how they can be best applied to ensure productivity, quality, safety and profitability. We’ve profiled innovative, forward-thinking companies and individuals, and have strived to keep the industry apprised of relevant news and issues. MetalForming has embraced webinars, conferences and various social-media platforms to better communicate with our readership. And, all the while, we have looked ahead for clues as to what information will help our industry, and how we can best deliver it. The hope is that we have succeeded in what we’ve tried to do. 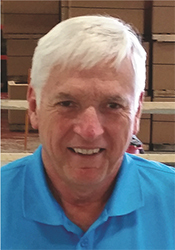 In the July 2013 issue, Brad Kuvin, then editor and now publisher/editorial director, chronicled the birth of MetalForming and its first 25 years. On these pages, we examine the period from 2013 onward through the prism of some timely and prescient articles originally presented in MetalForming. We also convey what industry leaders see coming over the next five to 10 years. Join us as we explore where we were, and where we’re going. It’s been, and should continue to be, quite a ride! As the industry evolves from stamping as an assembly-line process to cellular manufacturing, controls, with their ability to communicate with robots, transfers and other cell components, will enable the evolution. 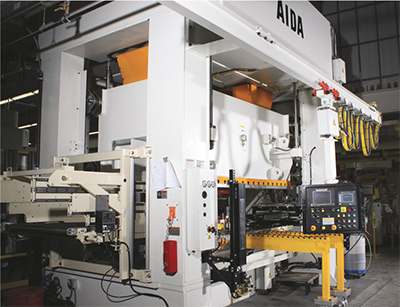 Servo-driven presses have revolutionized metal stamping. The industry, now with a firmer grasp on the technology, has put it to use for all manner of applications as metalformers recognize the competitive advantage. Case in point is Acro Metal Stamping of Milwaukee, WI. MetalForming highlighted the company in an August 2013 article, Smooth-Running Servos Usher in a Stamping Renaissance Period. The effectiveness of leading-edge press technology only improves when teamed with appropriate line automation. We explored the topic, and when such automation makes sense, in Top Five Ways to Automate Your Press Line, appearing in the May 2018 issue of MetalForming. The article offers that whereas press-line automation and robotics had long been considered big-dollar, high-support options for high-volume repetitive operations (think automotive OEMs and Tier Ones), lower price points and scaled solutions such as collaborative robots now have made such technologies more desirable in job-shop environments, and deserve another look. 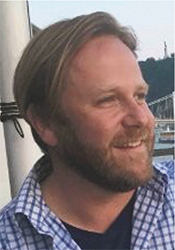 “Most people associate automation with increased speed and throughput, which mostly is true, but automation provides benefits beyond that,” Josh Dixon, director of sales and marketing for Beckwood Press Co., told us. He noted that safety factors such as repetitive motion, ergonomics and the need to transport heavier weights are, and always will be, prime drivers for automation. While automation traditionally has been applied to processes with well-defined work rules and little variation in parts and procedures, new technology advancements allow automation to better accept variability. 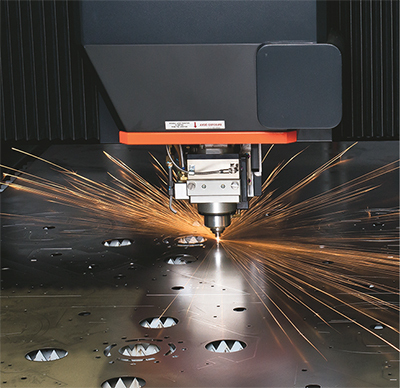 The past five years have seen fiber-laser cutting go mainstream, with more metalformers and fabricators recognizing the potential for huge throughput gains. Another factor that demands a new look at automation options is cost. Combining advanced press technology with automation, as Acro Metal Stamping found, has made North America once again an attractive manufacturing location. Proof is offered in Reshoring Trend Gains Momentum, a MetalForming article from December 2017. “For the third consecutive year, the number of manufacturing jobs returning to the United States equaled or exceeded the number of jobs lost to offshoring,” it reads, highlighting the Reshoring Initiative, founded in 2010 by industry veteran Harry Moser. His organization assists companies with assessing their total cost of offshoring, and with efforts to shift collective thinking from offshoring is cheaper, to reshoring reduces the total cost of ownership. In 2017, in conjunction with PMA, Reshoring Initiative named Mitchell Metal Products, Merrill, WI, the winner of its First National Reshoring Award. One of Mitchell’s recent successes—a reshored cultivator-handle subassembly that in 2016 went from 4500/yr. made overseas to 30,000/yr. made in Wisconsin—was detailed in the article. The company took advantage of servo-press technology, automation and other fabrication advances to bring work back and earn the honor. Hot stamping has undergone generational technology changes that now enable it to serve as a viable process for production of front and rear crash-zone parts, well past its early automotive applications for impact beams and pillars. Key is the ability to create ever more specific soft zones in the parts. Hot stamping has caught the eye of automotive OEMS and suppliers, and MetalForming has taken notice. 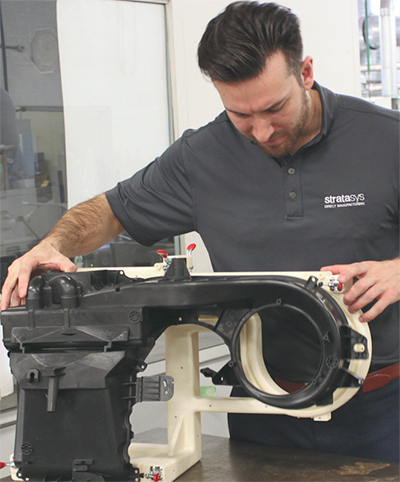 Thanks to decades of R&D, hot stamping has undergone generational technology changes that now enable it to serve as a viable process for production of front and rear crash-zone parts, well past its early automotive applications for impact beams and pillars. That’s the gist of an April 2017 article, Hot Stamping: Local Soft Zones Via Laser. 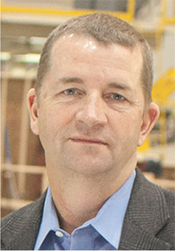 Key is the ability to create ever more specific soft zones in the parts, according to Paul Belanger, director of Gestamp R&D North America. Via this process, ultra-hard steel is formed into complex shapes, resulting in lightweight yet strong parts that, otherwise, typically would require thicker, heavier cold-stamped parts welded together. By using improved validation measures such as advanced forming and crash simulation data and software, Honda and Gestamp were able to better localize soft zones in the die during hot stamping, resulting in production of rear rails in the 2015 Honda Civic with soft-zone features that enable improved impact-energy absorption in the event of a crash. The development earned Honda and Gestamp the Steel Market Development Institute’s Automotive Excellence Award in 2016. 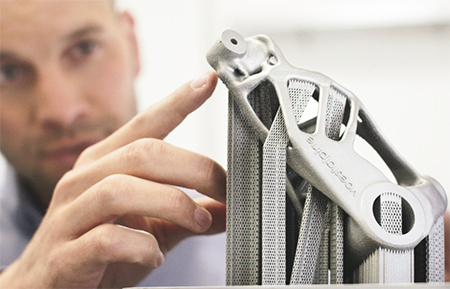 Additive manufacturing can be viewed as an essential tool in many manufacturing operations. Examples of its possible uses include the manufacture of fixtures and tools. The past five years also have seen fiber-laser cutting go mainstream, with more metalformers and fabricators recognizing the potential for huge throughput gains. 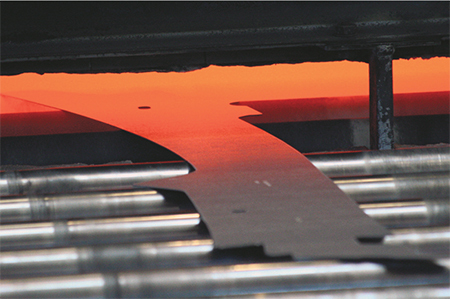 MetalForming trumpeted the technology in a June 2014 article, Energy Savings Convince Management of the Benefits of Fiber Lasers. 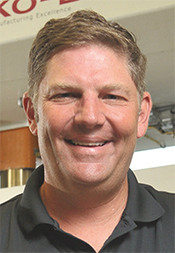 Justifying the investment of a 2.5-kW fiber laser machine by Reflex Industries, Elkhart, IN, came down to increased speed and decreased energy costs, according to the company’s engineering manager, Chris Heffner. The supplier to the recreational-vehicle, travel-trailer and utility-truck industries had added the machine to its stable of CO2 laser cutters and other fabrication equipment primarily to cut aluminum from 0.10 to 1⁄8 in. thick. On top of that, he spoke at length on the improved edge quality from using the fiber laser to cut aluminum sheet, in particular, compared to CO2. With fiber laser machines now available that feature three times the wattage of Reflex’s first, many other manufacturers are realizing significant advantages. Interfacing with the dizzying array of advanced machinery now at our disposal, and getting it to perform at its highest level, is a task managed by control systems, which have kept pace with equipment-technology improvements. Since its first conference—the Manufacturing ERP Experience—held August 23-24, 2011, MetalForming magazine has served as a premier provider of events designed to advance the metalforming and fabricating industries by providing executives, engineers and associates with a range of important learning opportunities on technological advancements in software, processes, equipment, materials and more, and how to effectively apply them. In other words, MetalForming celebrates its role in aiding industry professionals to discover solutions to metalforming and fabricating challenges, while encouraging innovations along the way. “MetalForming launched the ERP Software Experience, our first live event, to provide a platform where metalforming company executives and their IT leaders could evaluate ERP solutions from several suppliers, efficiently and in one setting,” says Brad Kuvin, publisher/editorial director, reflecting on our foray into conferences. “Several ERP-software companies were given space to conduct demonstrations, and we also invited industry consultants and experts to provide conference presentations on related topics, including tips on ERP software selection and implementation. Today, one-button operation is the ideal. And, as thinking evolves from stamping as an assembly-line process to cellular manufacturing, controls will enable the evolution. “The integration of ancillary devices into a single-button operation so that all systems are communicating—that’s where controls are heading,” Phillips said. The evolution of controls and communication capability dovetails nicely into another major development over the past few years, the emergence of the Industrial Internet of Things (IIoT). MetalForming has devoted significant coverage to IIoT and Industry 4.0 as well as its impact on MES and ERP systems. Consider this article, Heating Up: The Cyber Age of Automation Controls, in the July 2016 issue. Such connectivity also assists should equipment or lines fail or run sub-optimally. With so much information available, remote monitoring and diagnostics become orders-of-magnitude more efficient—no need to wait for technicians to arrive and perform lengthy troubleshooting procedures. But even with all of the advantages of big data, there are caveats, Heitbrink warned. Besides the need to accurately process data to arrive at informed, correct decisions, data-gathering itself presents challenges, he said. For example, the ability to tie the equipment to production people so that they can analyze uptime and downtime has advantages, but is limited by the accuracy of inputs. Recognizing that information needs extend well beyond what print can deliver, MetalForming magazine’s social-media efforts include regular Facebook posts and live video as well as Twitter tweets intended to provide readers with news and market-trend updates. And, our MetalForming Everywhere app brings the latest to your mobile device. We offer newsletters directly to your inbox detailing industry news and events as well as the latest metalforming and fabricating products, and also offer our print publication in digital form, delivered directly to you. Last but not least, all MetalForming content, including our newly developed podcasts, can be found online. As long as humans are part of the equation, they’ll need to be skilled and they’ll need to be trained to take best advantage of this communication and big-data revolution. And, if so, Industry 4.0 offers limitless possibilities for productivity improvement. The past five years also have brought a new player to the part-making game, additive manufacturing (AM), or 3D printing. In the August 2017 article, Add AM to Your Arsenal, MetalForming explored ways in which AM can become an important tool in a manufacturer’s toolbox. Can metal parts be taken from the presses, cutting machines and other metalforming equipment and instead be produced via printing? Not in the quantities and cycle times demanded by many customers, certainly not in the foreseeable future. Equipment and material costs, combined with the need for extensive post-processing to meet precision tolerances and yield acceptable surface finishes, all argue against a replacement of traditional stamping and fabricating processes. On the other hand, by shifting perspectives, AM can be viewed as an essential tool in many manufacturing operations. Examples of its possible uses include the manufacture of fixtures and tools. Investment in workforce development, and in educating future industry professionals, can spell success for individual manufacturers and the manufacturing industry as a whole. AM also can help produce what Wild called “hybrid fixtures,” which include, for example, hard contact points for a drill guide. “The fixture shape will be the same, but metal inserts are placed into the fixture component to address durability and wear concerns,” she says. As the article reveals, metalformers may be surprised by how much AM can help…and in unexpected ways. For example, at a recent aerospace conference, a speaker from a major defense contractor relayed how his company began using AM to produce jigs and fixtures to test large aircraft parts. The company had bought a new resin 3D-printing system with a huge build envelope such as one used to print automobiles. The machine was installed in an otherwise empty room and the engineers got right to work deciding what to make. One of them noticed that everyone was standing, as the room had no furniture. The first product they designed and built? A chair. For all of the talk of automation and IoT, ultimate success boils down to a trained, inspired workforce. Machines and technologies only perform as well as those who set up, operate, maintain and manage them. Progressive businesses recognize this, and so does MetalForming. In our March 2018 presentation on workforce development, we profiled leading manufacturers who take workforce development to heart. One, Oberg Industries, Freeport, PA, is an apprenticeship pioneer and maintains apprenticeship programs that span its processes. 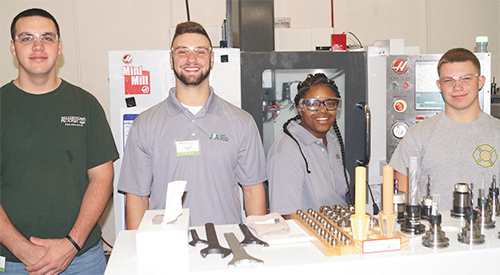 It also taps the experience of recently retired associates to help mentor newer hires, offers extensive, incentive-laden training options, and works closely with various entities to promote manufacturing as a career. “Employee development is overlooked by so many companies in our industry,” said Greg Chambers, Oberg director of corporate compliance, stressing that employees can’t be expected to grow and succeed without resources or skills development. To that end, the company has invested heavily in mentor training. Those completing the course receive NIMS certification for on-the-job training and are compensated for their efforts. Also, via the National Network, Oberg has instituted a Common Employability Skills curriculum featuring weekly one-hour sessions taught by employees and taking into account nontechnical skills such as communication and critical thinking. Recognizing and rewarding significant achievement and effort put forth by employees, training at Oberg also includes college recognition for those qualified, allowing them to receive a certificate and walk with other college graduates on graduation day. The positive effect of workforce development cannot be overstated, just ask Oberg Industries. Also not to be overstated is the level of diversity now found in manufacturing operations, from the shop floor to the top floor. Recognizing this, in 2016, MetalForming introduced its Women of Excellence in Metalforming and Fabricating awards program. The annual award honors women in leadership positions or on the shop floor, those who represent dedication to their company and the industry, and demonstrate excellence in meeting their workplace responsibilities. The November 2016 issue of MetalForming recognized 30 industry professionals as winners that year, with 19 more earning honorable mention. Look for coverage of the 2018 Women of Excellence in Metalforming and Fabricating award winners in MetalForming’s December issue. MetalForming: During the next five years, what steps must metalforming companies take to ensure continuous evolution and innovation? William Adler, president/CEO, Stripmatic Products, Inc. Patrick Steininger, president, Sko-Die, Inc.
Joshua Hopp, president, HK Metalcraft Manufacturing Co. Colin Cosgrove, president, Laystrom Manufacturing Co.
Jody Fledderman, president/CEO, Batesville Tool & Die, Inc. David Arndt, president, Pentaflex, Inc.
Kevin Clay, vice president of sales and business development, Pridgeon & Clay, Inc.
Adler: In order to remain forward-thinking, we emphasize networking and plant tours. I bring managers from other plants through our shop—ours is a very open shop—and I show them our equipment and processes, and then I ask where we can improve. Then, when I’m invited on a plant tour, I do the same. That’s how you get better. The fact that we embrace laser welding is a direct result of such networking efforts. Steininger: Agreed. Being open to change, all the time, is important. We work with local noncompeting manufacturing businesses to learn what’s going on at all of our facilities. We have different groups representing operations, sales and management. Companies provide representatives of those job functions and those groups visit one another, providing objective criticism and suggestions, with everyone benefiting from the shared expertise. Hopp: It’s about pursuing intelligent benchmarking with like-sized, like-minded companies. What you gain could be as simple as a template for quality metrics or displaying employee photos with their start dates on the shop floor. From others, you can learn how many toolmakers they have per press operator, or who should be in charge of production planning. After a networking meeting I changed the responsibilities of who controls our production planning and who controls the dispatch list, and our new system runs much smoother. Cosgrove: Finding ways to share the company’s vision throughout the organization is important. We’re good at pulling back the curtain and sharing agendas, strategic initiatives and what’s going on in the company. People are hungry for opportunities to contribute, if they feel part of the vision. When they do, that fuels innovation and evolution. Fledderman: Today’s technology provides opportunities for us to evolve, but we must stay on top of it because technology is moving more quickly than ever. In the 1980s, we gained innovations such as link-motion presses, wire EDM and CAD/CAM. If you didn’t get on board quickly with those technologies, you lost business. The same is happening today with servo presses, 3D printers and IIoT. One way to stay on top is to find the brightest talent. That may mean broadening your search beyond the local labor pool, and in some cases, looking abroad. MetalForming: In which technology areas must your company show improvement and what are you doing about it? Arndt: With fewer workers available, automation, definitely, is an area where we’re looking to improve. We’re currently using two servo presses and striving to stay competitive with the latest technologies, including upgraded transfer systems and control systems on our presses. Also, we have an automated assembly cell with material-handling and welding robots. These additions allow for the work to be performed with one, rather than three, employees per shift. Fledderman: Automation is one of those weird terms that makes most everyone automatically think of the same thing: robotics. Yet, there are many other ways to automate. Think down the line and identify opportunities for task-specific equipment such as pick-and-place units. 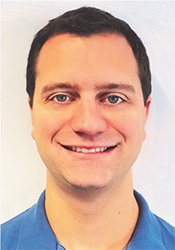 Cosgrove: Perhaps the most intriguing new technology is collaborative robotics, which can be readily deployed to different work centers and areas, especially when variety and turnover of parts is high. We recently had a rental unit in our facility for several months. Right now, we’re treading water, but next year we expect to have the right application for collaborative robots. Clay: We’re working with a couple of collaborative robots, and this will receive a lot more focus in the next few years. We’re also transitioning to laser welding and expanding our validation-testing capabilities. We’ve always invested heavily in research and development, and we’ll continue to do so as opportunities present themselves. Adler: We will continue embracing automation, both in terms of product capability and quality inspection, with one of our goals being to achieve 100-percent automatic inspection of parts, where, using vision systems, cameras and lasers, we’re able to inspect every key feature of the parts we produce. It’s a matter of integrating existing inspection technology so that parts are handled automatically and presented to the inspection equipment, quickly and accurately. Our goal is to be there within the next five years. MetalForming: What are your company’s greatest nontechnology challenges, and what are you doing about them? Adler: Ongoing challenges include improving uptime via predictive maintenance and in-depth troubleshooting protocol, and finding the time to cross-train our very busy employees. Clay: Attracting the right people is a great challenge. Four-year colleges aren’t producing the employees we need, namely skilled tradespeople. It’s important for companies to aggressively offer training and tuition assistance to committed employees, while reaching out to local school districts to make administrators aware of employment opportunities. This takes involvement. For example, we’re involved with assisting local students with their robotic teams. Finding bright young people and getting them interested in manufacturing must be a priority industrywide. 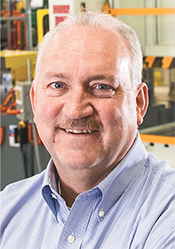 Cosgrove: Chicago’s Manufacturing Renaissance Group, for which I served as a committee co-chair, is driving manufacturing in three area high schools, where they connect students with local companies. Currently, 180 high-school students receive technical training as part of a feeder system for manufacturers. 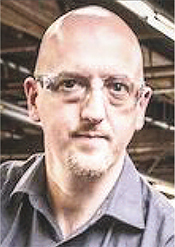 I started my career on the shop floor as a press-brake operator and worked my way up. Students need to know that there are good career opportunities in manufacturing. Hopp: Just finding reliable workers can be a challenge. When we have employees who want to work and learn, we invest heavily in them with formal and on-the-job training. For example, one of our toolmakers demonstrated that he wanted to expand his knowledge and have more influence on the success of our company. This tenacity was appreciated and he now is our pressroom manager. Next year we’re enrolling him in the PMA Management Development Academy (www.pma.org/mda). Another young man, hired to cut tubes as a temporary employee, would find his manager after completing a task and ask, “What can I do now?” After a series of promotions over two years, he is our secondary process lead man. Arndt: Programs such as PMA’s METALFORM EDU (www.pma.org/metalformedu) help us to gain training for our new employees, freeing up my engineering resources, supervisors and floor leads from spending large amounts of time mentoring. Steininger: Effective mentoring may not always be job-related. We’re addressing people not showing up for work through an outside pilot program that provides financial coaching. If an employee’s financial house is in order, and he or she has a manageable budget, insurance, etc., then there’s a greater chance that we’ll have a more productive and focused worker, rather than one worried about paying for braces or a car. As metalformers and fabricators prepare to face coming challenges, expect MetalForming to continue reporting on these challenges and presenting solutions. 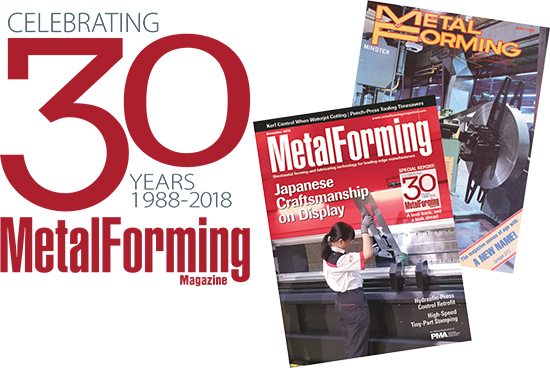 “We recognize that metalformers today perform a wide range of tasks to turn sheetmetal into finished products, including stamping, cutting, bending and welding,” explains MetalForming publisher/editorial director Brad Kuvin. “To succeed, they need consistent, accurate information on these technologies, and others, and on best practices for implementing them. And, they also must stay current with information technology such as ERP and MIS software, and on automation solutions. All of these have become critical areas of focus for MetalForming magazine as our editorial mission has evolved over the years.